I enjoyed all the exhibits at the Tate Modern and I learnt from the workshop on detail and patterning that I attended with Ely Leach. However, my favourite event was the research I carried out on Andy Warhol’s life and artwork, after seeing his self-portrait at the Tate Modern in London. Warhol (1928 – 1987) was an American artist, entrepreneur, sculptor, producer and author. His work covered a wide range of media including photography and painting. Andy Warhol is still so influential after his death that he has a whole museum dedicated to him in his native town of Pittsburgh and is inspiring people at my age and in my time. Andy Warhol turned to reading magazines and DC comic books when he was ill as a child. In 1949, Warhol graduated with a degree in Pictorial Design from what is now known as the Carnegie Mellon University. After that he moved to New York and started his career in commercial assignments, using ink drawings to design shoes and creating window displays for shops. Warhol turned to painting, drawing and exhibiting his work in the 1950s, but it was the 1960s that saw the development of Andy Warhol's career in PopArt (creating art using everyday commercial items as the subjects). Warhol drew upon his extensive knowledge of advertising and painted iconic American objects like dollar notes and Coke bottles. It was during this period that one of his best known works, the Campbell's Soup Cans (1962), made in silkscreen painting gained recognition during a notable exhibition in 1964 called “The American Supermarket”. This exhibition was very successful so much so that it has recently been recreated by the Tate, Liverpool in 2002. The '60s also saw Warhol painting well-known people such as Elvis Presley, Marilyn Monroe, Marlon Brando and Muhammad Ali and images of current affairs like the protesters during the 1963 Birmingham Campaign of African-Americans. In March 2018, I attended Warhol's exhibition in Room 12 of The Tate London titled “Beyond Pop”. There were various pieces there, but I had gone to see his self-portrait, which I had found when looking up events on the Tate website and which had introduced me to Andy Warhol's work. The portrait was done on canvas in synthetic polymer paint and silkscreen and made me want to explore more of his work. (https://i.pinimg.com/736x/63/f8/55/63f85508808a14c3a6164ca090498fcd.jpg) I can deduce a few things about Ali’s personality. The red and orange around his fists show that Ali has a fiery spirit and is quick to fight. However, the cool blue around his head shows Ali to be an intelligent and calculating thinker. 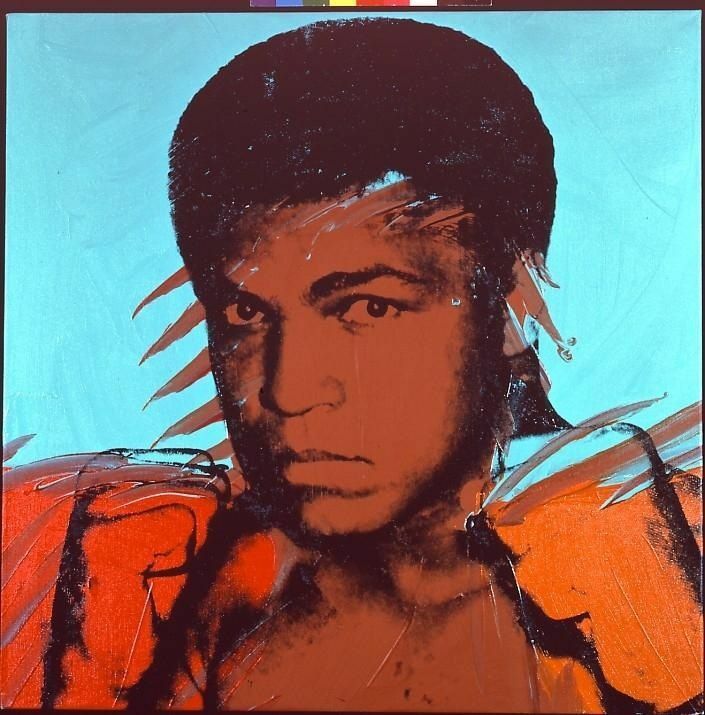 There are other colours of the same painting which could be interpreted to also show different sides to Muhammad Ali’s personality and character. Even though the conventional use of pastel colours (not the media itself) is usually subtle, Andy Warhol went against this norm and used the effect of pastel colours to make his pictures stand out even more. This is interesting because, without the density of colours, Andy Warhol’s pictures would just look like normal photographs. I had tried to explore the use of colour before I discovered Andy Warhol’s work, but I am a self-taught artist so I had not realised that there was a name to this method - ‘pop art’ till I started looking into Warhol's work and life. Andy Warhol’s art has also encouraged me to see shadows in a different way. However, as I started out exploring patterning and detail, I was also excited to see how Warhol used these features extensively and intricately without detracting from his original piece. 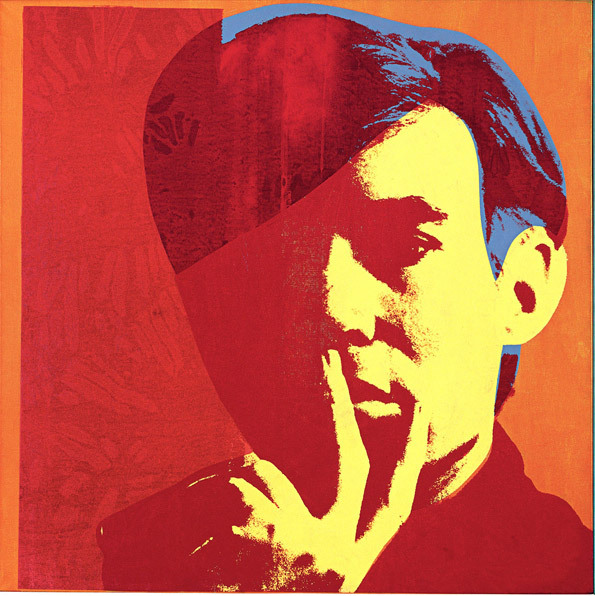 An example is his 1967 self-portrait here - https://1.bp.blogspot.com/-UJA-Gz9GMu8/UNsei-vH21I/AAAAAAAAAKs/2kZ7APaO7mw/s1600/Andy+Warhol_Self-Portrait_1967.jpg In this picture there are patterns on the left-hand side that add a different but subtle dimension to the artwork without detracting from the main subject. This is particularly interesting to me, as I have been working with Ely Leach to study details and patterning using Zentangle. I can see the potential for adding different layers of personality to my artwork, like Warhol did, by using intricate patterning in my backgrounds. http://warholfoundation.org/legacy/biography.html, 'Andy Warhol Biography, Pop Artist and Cultural Icon', 2016. 'Still life at the Check-out', December 2002. I am a 15 year-old self-taught artist with an interest in manga. I also like physics, maths and comics. It is Done: Batman - The Result of a Tormented Child! An original character called ‘ThaKidThatCould’ and his interests. Andy Warhol was a revolutionary pop artist and LGBT icon. Great stuff! This was very inspiring...I found your study of the language of color used in Warhol's art to be very significant. Thank you so much, Jaya, for raising awareness for the arts. In this modern era we have lost such a value for creativity. I appreciate your engagement and critique if Andy Warhol. Keep it up! Hi Jaya, your research is interesting. It would be interesting to know a little bit more about the media used in the piece. Is it a painting or a collage? Is it oil on canvas or acrylic on board for example. The image you provided doesn't give us digital viewers much of a clue but we know you had the brilliant experience of viewing in person. It's nice to see you did a great review of colour language, but what else does the piece say to you? Why do you think he used this media and do you think it was successful? Would you have done anything differently? Very interesting, being an art novice it helped me look at Andy Warhol's work in a different way. For me it looks so simple and yet as you describe there is a lot more depth and details to discover. Thank you for taking me on this journey. Thank you, Nicola. I have redone my article using the tips you gave. I have also added a bit more information on Andy Warhol as a person. I hope it reads better now. Peggy, that is really nice. Thank you. What a great review Jaya – really good to read how thorough you’ve been. You’ve researched Andy Warhol’s rise to artistic success, his association with famous screen and media celebrities and how he used iconic objects to inspire him, but you only touched briefly on his illness as a child that seems likely to have led him on this path. I wonder if you’d felt any other parts of his life influenced his work or if his work as an artist influenced his adult life. Sometimes the motivations behind the artist drive their popularity and sometimes popularity drives the art. Something to think about perhaps. Your reflection on Warhol’s use of pushing the conventional use of media is really interesting and your final paragraph shows that you, as an artist, have found inspiration in Warhol’s approach. I’ve really enjoyed seeing all your work throughout your arts award Jaya, your own work is really something to be proud of.